If you are a mom with little kids they probably ask you for a puppy at least once a month. Now we already have a dog but of course they want a puppy. I let my 6 year old adopt Talking Duke on my iPhone today. She recorded about 40 versions of Duke repeating what she had to say. The voice recording playback was her favorite feature. 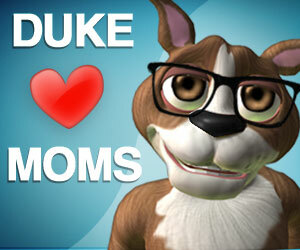 Duke also loves mom.